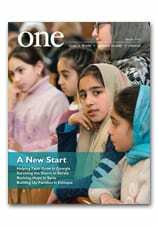 In the current edition of ONE, photojournalist Raed Rafei reports on Iraqi Christians returning to their homes, and facing a very different existence along with some Hard Choices. Here, he adds some additional impressions. Driving around the desolate town provoked an eerie feeling. How does one make sense of a once-thriving town that had witnessed for so long the daily hustle and bustle of people walking its streets, shopping from its stores and praying in its churches, now condemned to terrifying silence? Batnaya, an Assyiran town north of Iraq, is one of the most heavily destroyed places after last year’s ferocious fighting between ISIS militants and Kurdish forces. Entering the town, one sees entire streets of one collapsed building after the other, an apocalyptic awe-inspiring scene. Driving me through the mayhem, Rani Salam Asmaro, 31, points to a large empty piece of land. He remembers with disbelief the large soccer tournament organized on that field few years ago. It is hard to imagine how life can be sucked out of a place like this. In the old town, we walk in the narrow streets where Islamists had left so many signs of a hateful ideology. At the entrance of a church, a handwritten sentence reads: “There is no place for the Christians in the land of Islam.” For Asmaro, a fitness trainer and an aid to a priest, the most painful aspect of the conflict is the realization that Christians who had found home in Iraqi land thousands of years ago would be “abhorred” by their Muslim neighbors and attacked so savagely because of their faith. Asmaro says that he always had Muslim friends but that he cannot trust them anymore after everything that happened. I heard about this feeling of betrayal from many Iraqi Christians. For centuries, Christians have been an integral part of society sharing life with their neighbors from other ethnic groups. What the latest conflict has most tragically produced is the exodus of hundreds of thousands of Christians, but also further isolation for those who remained. Beyond the reconstruction of homes and churches, this will be the most challenging aspect of life in Iraq for Christians for the coming years. How can Christians feel trust again towards their Sunni neighbors and re-establish relations with them? For the Church leaders I talked to, the time is now still too early to talk about reconciliation. People need time to heal their wounds first. Asmaro believes that the intolerance he has experienced as a community in Iraq has only strengthened his Christian faith and his determination to remain in the land of his ancestors. Asmaro is planning to get married to his fiancé soon and start a new family. I met many young men and women who were still marrying and having children despite the many uncertainties they faced. Asmaro comes from the town of Al-Qosh, the only Christian enclave that was not occupied by the Islamic State. The inhabitants of Al-Qosh are people who are very proud of their Christian heritage and refuse to sell land to anyone whose origins are not from that town. They believe that this policy had protected their village from losing its character. What makes the town historically significant is the ancient tomb of the Jewish prophet Nahum. Many believe that this sacred place protected the town from invasion from Islamist militants. Others say that the strong Christian faith of the town’s people kept it safe. A more rational explanation is that Al-Qosh lies beyond an international road vital for commerce between Iraq, Syria and Turkey. Regional powers would not have allowed the disruption of traffic along that road where goods and oil are transported, some say. Asmaro’s brother, a professional singer, has composed many songs to express his love for his town. One of his video clips hails the resistance of Al-Qosh in the face of invaders and shows proud men in traditional clothes carrying arms and stationed in the mountain overlooking the town. Asmaro remembers how, in 2014, he stayed with these men to protect their town from a possible invasion. Families had been evacuated to nearby safer towns. “Despite the danger, with a friend of mine, we would sneak into the town to exercise for few hours at the gym there,” he said. Read more in the September 2017 edition of ONE.